BUT ... have you ever noticed that when you sit beside someone who is teaching you something that you are interested in learning, that the "age" barrier seems to disappear? Focus on both sides becomes that of passing on the knowledge and often the eagerness is contagious on both sides! Teaching a friend to knit has that affect on me .... it doesn't matter to me if you are 7 or 75 .... coordinated or clueless .... there's something rejuvenating about sharing.. and for Christmas this year, i plan on making 'lessons' one of the gifts to give to some of my friends. 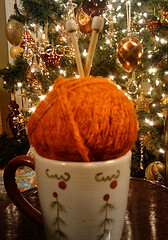 I'm starting to buy Christmas mugs now and watching for yarn and needles to go on sale (or good coupons to help with the purchase!) .... Attach instructions for a Cap-pucino, along with time to sit and knit .. and the bond between us will be taken to a much deeper level! The key in in the Connection .... and this morning .. i have discovered the fountain of youth! according to physical measurements of age and agility my 'calendar' is winding down .. my strength isn't nearly what it used to be, my eyes DEFINITELY have issues and my arms aren't EVEN long enough ..... and yet, in so many ways i am stronger than i've ever been .. and i find that my strength and youth are rejuvenated according to the investment and infusion of time spent with the Lord! for ages and generations, but is now disclosed to the saints. so that we may present everyone perfect in Christ. which so powerfully works in me. not anther SCARF! ! ! ? ? ? too big for my britches . . .
what IF you Turn the Page? . . therapy . .
. . He started it!